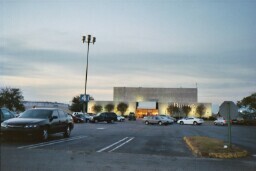 With the flooding of the city of New Orleans, the Lake Forest Plaza, which is located in hard-hit New Orleans East, was devistated by floodwater. While the structure appears to have withstood the wind, the water definitely got to it. It most likely took in several feet of water, and from Interstate 10 which runs right next to it, there has been no visible cleanup of any kind. 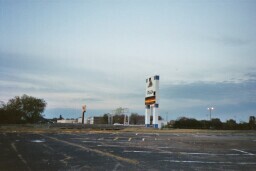 My guess is that Hurricane Katrina put the final nail in the coffin for what was the Lake Forest Plaza. I too witnessed firsthand the steady decline of the Lake Forest Plaza mall in New Orleans East. I was born in 1975, the year after the mall's completion, and grew up in a New Orleans neighborhood roughly equidistant from the Plaza mall and Lakeside Mall in suburban Jefferson Parish (i.e., county) During my childhood, I recall going to both these malls with the same frequency. Their fates have definitely diverged. Like the other contributors, I remember the funky earthtone colorschemes and faddish diamond-plan design that marked the Lake Forest Plaza. The place seemed vast and labyrinthine to me. There were four principal interior shopping concourses - the four sides of the diamond - and an interweaving network of connecting passages. The free-standing anchor stores occupied the points of the diamond, and, as everyone hastens to add, in the middle of the mall was an ice-skating rink. By contrast, Lakeside Mall was much older, having opened in the late 1950s. As a child I remember it feeling a bit tired. Lakeside had a simple linear plan with several protruding spurs. Though Lakeside pales beside some of the unfathomably enormous and prosperous malls of, say, suburban Virginia or Atlanta, it is today (several renovations later) the most successful mainstream mall in metropolitan New Orleans. As Avery notes, the mid-1980s oil bust was a significant factor in the Plaza's decline. The rest of the country welcomed the collapse in oil prices, but in cities like Houston, Dallas and New Orleans, the effects were devastating. I think it was around this time that I started hearing my parents and other adults relate stories of holdups in the Plaza's parking lot. Certainly by the time I was in middle school, my family had begun to visit there less and less often. The bust also killed off most of the better-known New Orleans department stores, most of which had locations in the Plaza. To top it off, the mall's complex architectural plan was confusing to shoppers; I guess what entranced me as a child maddened adults! 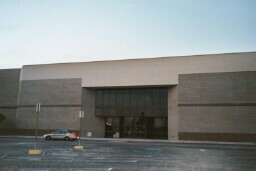 By the late 80s, the mall had lost many of its original tenants, but all of the original anchors were still in business, and mall management was successfully leasing retail space. The mall had stumbled but wasn't yet dead. At the same time, the owners decided to update the now embarrassing disco-era finishings. It was circa 1988 that the interior changes noted in other postings were accomplished. Earthtones were supplanted by eighties pastels, the skating rink was removed, and that area was positioned as a food court for the mall. Mall management also succeeded in attracting a new anchor store, Mervyn's. By 1990, the mall was renovated, 80-90% occupied, and boasted five anchors: Maison Blanche, Dillard's (originally D.H. Holmes), Sears, Mervyn's, and a four-screen cinema. 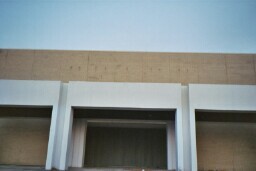 To punctuate the renovations, the mall's name was officially modified to "The Plaza" with the removal of the "Lake Forest" component. So far so good, I remember thinking. But the investments didn't change the slumping fortunes of the property, and the first hard blow came when Sears pulled out, around 1992, I think. 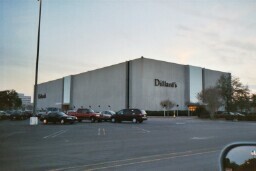 Dillard's followed around 1996. Interestingly, I ran into the store's former manager not long thereafter. He explained that city government had pleaded with the corporation to keep the store open, but that unbearably high merchandise shrinkage rates made it too expensive to do so. So the store was apparently shoplifted into bankruptcy. I wonder how widespread that problem was, and the degree to which such issues contributed to subsequent store closings elsewhere in the mall? In any event, Mervyn's closed almost immediately afterward, as did the cinema. Within the period 1992-97 the mall collapsed, with Maison Blanche remaining as the only anchor tenant. It was Dillard's purchase of that chain in 1999 which reestablished the company's presence at the mall. The Plaza changed hands in 2001 or 2002. It was purchased by a local real estate developer who has thus far failed to resuscitate it. The only plan that came to fruition was the construction of a new twelve screen, stadium seating-style theater, named The Grand. Word is that the Grand's revenues have fallen far short of expectations, and the city recently agreed to a debt restructuring (part of the financing was publicly originated). Maybe two years ago, the respected Urban Land Institute was asked to pass judgment on the mall's prospects and recommended demolition and replacement with a mixture of more viable power center retail and some new urbanist-esque redevelopment. Still, the mall struggles on in a sort of half-life. I recently visited the Dillard's and found it to be extremely well-kept and well-stocked. I bought a nice belt. The mall's management appears to have moved stores around, so that the quarter or third of the mall nearest Dillard's is practically fully occupied, while the corridors nearer to the abandoned anchors are mostly vacant. I personally have seen several movies at the Grand, and have been completely satisfied. The Grand's underwhelming performance is a bit mysterious, unless its very location in "da East" (i.e., New Orleans East) is the crippling factor. Ultimately, the mall's site is undoubtedly caught up with the fate of its surroundings. Though New Orleans East is largely a collection of well-maintained single family houses of varying sizes, with a median household income not inferior to the metro area's, its public image in the eyes of outsiders is dominated by the visibly lower-income and wholly minority large apartment complexes that are regrettably clustered just west of the Plaza. As the performance of the Grand apparently indicates, no one from outside New Orleans East is willing to do anything but drive through on I-10. However unwarranted, public opinion is hard to change once it's established. In the span of thirty years, New Orleans East has mutated into "da East" in the minds of New Orleanians, dragging the Plaza down with it. I lived just outside of New Orleans East from 1975-1989. I had a sibling who attended a school for the hearing impaired just down the street from the Plaza, so I spend the summer of 1976 at the mall four days a week with my mother. A 5 year old at that time, I can still remember many details about the Plaza. In December, 2004, my husband, daughter and I made a visit to New Orleans. It was my first time back since we moved away, and I was able to describe some of the changes to my family that had taken place between then and now. As I remember the Plaza in 1976, before it began it's downward spiral, it was a sprawling, innovative and quite unique establishment, as all of the stores and hallways were boasting the colors of the 70's (brown shag carpeting and orange and silver foil wallpaper in my mother's favorite shoe store, and dark flooring and walls in the corridors). The many skylights throughout the corridors brightened up the area. A couple of my favorite parts of the Plaza included the ice skating rink, centered within the mall with several corridors leading to it from various areas of the building. There wasn't really a food court, other than two or three small food outlets surrounding the ice rink, but there were several other restaurants within the building including a McDonalds with an indoor playland, and a Farrels (which when out of business in the late 70's or early 80's). I also recall the signs within the hallways hung vertically on the outsides of each store, a feature which is now gone as well. I was too young at the time of the Plaza's massive decline to comprehend why it happened. But it did decline, very badly, and after reading Mr. Avery's commentary, the progression of events of that time as he described it sounds very accurate. I don't remember the changing of names or the closing down of any of the anchor stores, but I recall some of the small shops and restaurants changing hands or shutting down and the decline in the numbers of people shopping there. My mother stopped shopping at the Plaza in the early 80's. Upon our visit to Lake Forest in December, 2004, my husband and I were surprised in several ways. The outside is in about the same or worse level of disrepair as in the pictures shown by Mr. Avery. My pictures will also show the condition of the parking lot, which is battered with cracks and potholes, and is littered with garbage, some of which is quite interesting garbage! Many areas of the outside are decoratied with graffiti. I have long thought that customer service was a dying art, but to my pleasant surprise, the store clerks as well as other customers were extraordinally FRIENDLY!---Something we don't see in our snooty Florida town. My guess is that about 2/3 of the stores were unoccupied, and all but one of the anchors were still abandoned. There is a food court where the old ice rink sat, albeit not a very large food court, and to my amusement, the old Chinese food restaurant within the court that I loved as a 5 year old was still operating, even with it's original storefront of bright yellow tile and red lettering. Back on the exterior, the old Sears and D.H. Holmes buildings looked to be in the worst condition. Dillards is now occupying an anchor. You can still see an imprint of the old MB logo on the storefront of what used to be Maison Blanche. In the mid to late 1960s, affluent New Orleanians became incensed with the traffic, growing crime, and gang activity of living in the inner city. Thus, suburbs such as Metairie, Kenner, Harahan, and Houma began to grow. Those who did not move south or west moved to what was becoming known as New Orleans East, into a neighborhood known as Lake Forest. Homes and scores of apartment properties were built to supply the housing for the rapidly growing region. It was decided in the early 1970s to build a regional mall in Lake Forest, and in 1974, The Plaza at Lake Forest opened at the intersection of Read Boulevard and Interstate 10. 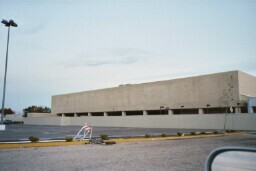 It was -- and still is -- the largest enclosed shopping center within the city limits. 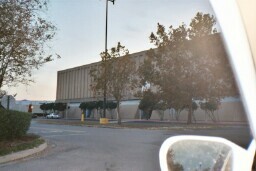 It was also the first center in Louisiana to have an indoor skating rink. The mall opened with many merchants moving from the outdoor Gentilly Woods Shopping Center, just across the river. The Plaza originally featured New Orleans institutions Maison Blanche, D. H. Holmes, Gus Mayer, and a spacious two-floor Sears store. The interior of the mall was done quite attractively with its numerous skylights and store names placed vertically along the corridor walls. It was indeed a sight to see -- and those who shopped there really enjoyed it. Then -- the oil bust. The numerous apartments and homes which had been built in the neighborhood -- aside from being built on marsh land -- suddenly faced dilapidation, vacancy, and foreclosure. Many became Section 8 properties, and with that, the gangs and miscreants moved in to what had been planned as the neighborhood where the mostly affluent people lived. The last time I was actually in the Plaza was in August of 1990. Dillard's had already purchased D. H. Holmes and stripped it of any New Orleans flavor. All of the other stores seemed to be in business and were doing okay. The ice rink was gone, however -- replaced by a food court. Today, however, Sears and the Dillard's that had been Holmes are gone -- there has been such damage to the old Holmes location that all that remains of the store's entrance facing Interstate 10 is the rolling metal door -- the glass and metal doors are completely gone. The Gus Mayer store was replaced by a Mervyn's which also closed and has suffered vandalism. The parking lot is riddled with potholes. Dillard's -- which purchased the parent company of Maison Blanche in 1998 -- is the only department store left. That is the only reason they are still there. Not only did the Plaza suffer, but many businesses in the area either gave up or shut down. Service Merchandise closed well before the company went broke. Across the street was an Acura dealership that now just sells Hondas. If you're in this neighborhood, you won't be able to buy an Infiniti, Acura, Lexus, or Cadillac unless you head back into New Orleans proper or Jefferson Parish. It's hard to pin the blame as far as what exactly happened at Lake Forest, other than the fact that it was just a good neighborhood gone terribly, terribly wrong.